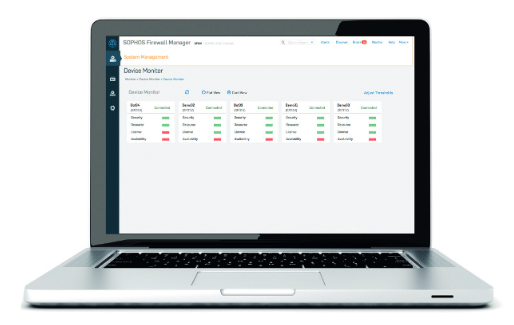 Sophos Firewall Manager (SFM) provides powerful centralized management for all your Sophos Firewalls across multiple customers sites or branch offices – all from a single screen. Whether you’re an MSP, Enterprise Network Security Admin, or simply managing a few small offices, SFM simplifies security management enabling consistent enforcement, easy provisioning of new policies, and at-a-glance monitoring of device health. SFM saves you time, money and makes management simpler. Centrally manage firewall policies and configuration for all your security features for network protection, Application filtering, Web filtering, IPS, VPN, Email, and more. And we make it easy by ensuring the controls and user interface are consistent between Sophos Firewall Manager and the on-box management console. Simply point your new firewalls at SFM - a convenient wizard guides you through the device enrolment, compatibility checks, and device synchronization in just a few clicks. You can push, pull or replicate policies amongst your various firewalls or have new devices inherit policies automatically when they come online. Eliminate security risks by deploying your policies consistently across distributed firewall deployments from a single console. Sophos Firewall Manager makes it easy to ensure uniform policy implementation across all your devices. Create re-usable configuration templates that help you save time and effort setting up a new device or customer. You can create a new template, clone or copy an existing template or create one from an existing device configuration. For example, apply a branch office template to new branch offices easily or create special templates focused on particular needs like an education vertical. Save time updating each firewall separately by managing firmware updates from Sophos Firewall Manager. Also, manage pattern updates centrally and maintain a configuration back-up repository locally, via FTP or over email. Monitor the health of your managed devices including their security, resources, availability, and licensing status all from the central dashboard. Utilize a variety of views to focus on just what’s important and adjust threshold values for monitoring parameters based on your specific business needs. You can configure alerts to get notifications on a broad range of events including subscription expiry, gateway status change, excessive disk usage, ATP events, IPS and virus threat counts, unhealthy surfing, and much more. Event thresholds are completely customizable, ensuring you only get alerted when it’s important. Conveniently group devices by model, firmware, country, device name and more for quick and easy action, management, and monitoring. Maintain centralized control over what each administrator can do through Sophos Firewall Manager’s role-based administration. Delegate role-based access to different members of your IT staff based on their security functions such as VPN admin, App and Web Security admin, IPS admin. And in doing so, limit their access to other functions that are not related to their job roles or keep it read-only. We’ve made change control easy. View details of configuration changes, compare different versions of configurations and roll back configuration changes to discard unwanted changes. Sophos Firewall Manager offers you a complete audit trail of policy and device changes to help with compliance management. Utilize SFM’s detailed audit logs and views of administrator and device activity for forensic or regulatory compliance investigations across your distributed network. Deploy SFM as a a hardware appliance, software appliance (on compatible x86 hardware) or as a virtual appliance on VMware, Xen, KVM, or Hyper-V platforms to meet your virtualization objectives of saving cost and rack space. Sophos Firewall Manager integrates easily with the new Sophos iView enabling auto-provisioning of managed devices and automatic synchronization of administrators in the new Sophos iView. * These are guidelines only. The exact capacity will depend on a variety of factors including network activity, traffic volume, number of users, and other metrics. Virtual and Software deployments of SFM are licensed based on the number of devices managed and a no-charge evaluation license is available for managing up to 5 firewall devices. Download the Sophos Firewall Manager Data Sheet (PDF).